I’ve been remiss in posting follow-up on our Italian museum exhibition project, I Trentini e la Grande Guerra: un popolo scomparso e la sua storia ritrovata. This project is an attempt to find new ways to experience history through the lens of modern methods and materials. It’s installation art, a museum exhibit, and a way to involve the public in the act of making history. The exhibition opened to great fanfare ‘way back in August (ahem…), it’s been a resounding success, and if you’d like a tour of the SL installation on our Gallerie della Memoria sim, IM me in-world. 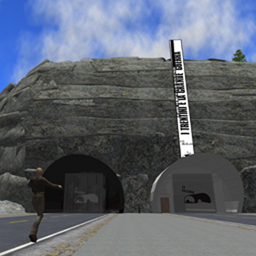 I’ve set up a replica of the exhibition site, with the two tunnels containing a rich collection of streaming media prepared from archival material by Second Life media guru Media Hax. Nearly all of the photographic content from the book published to accompany the exhibition is available there, along with four feature-length films produced for the exhibition, slide shows of construction and inauguration, and other bits and pieces. For those of you who speak Italian, I am delighted to direct you to a presentation by FilmWork of Trento, Italy, co-producers of the exhibition. This video, entitled Gallerie (Extra), and the other visual materials presented on their website present a comprehensive chronicle of this historic project. View it here. Update: View an English-dubbed version of the project video. 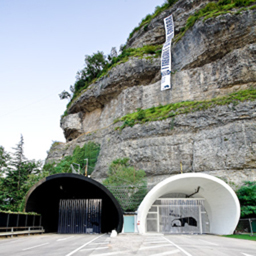 This project was realized by FilmWork, Studio Terragni Architetti, and the Stanford Humanities Lab, under the auspices of the Fondazione Museo Storico del Trentino.